For the vast majority of homeowners, the arrival of colder temperatures usually means that the time has come to clean and store their patio furniture, close the pool, winterize their vehicles and/or determine if the snow blower requires service. It is quite likely that thoughts about completing any yard or landscape construction projects are not top-of-mind. However, there are in fact several outdoor projects that can be done in the late fall and into the winter months – and by taking advantage of this timing, homeowners and their families can have more time to enjoy and appreciate such amenities and new landscape designs when the spring and summer seasons return once again. While any/all of these non-customary steps and precautions might allow the above-noted landscape construction to be performed throughout the fall and even into the winter months, it will be important to note that overall project costs may be somewhat higher as a result. Homeowners will hence need to consider this budgetary aspect as well when assessing the advantages of contracting a service like Landcare for any late fall/winter outdoor project work. During the winter months, when all the trees are bare and there is an absence of colour throughout your property, the appeal to spend time in your backyard could be much less than it is in the spring, summer, or fall. However, because there is less obstruction from foliage and other outdoor décor, the winter is an excellent time to perform a site analysis of your property and to plan any landscape construction changes for the following year. The landscape design team from Landcare can use this less-obscured vantage point to help you visualize a transformation of your current landscaping and property contours into the retreat or sanctuary of your dreams. 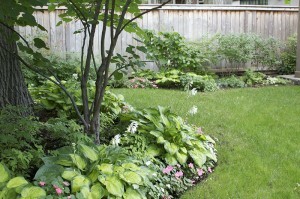 Take advantage of seasonal opportunities to plan and implement your new landscape construction ideas. Call the professionals at Landcare today at 416-410-0320 or contact us to discuss the services that we can provide during the fall and winter months to give you and your family added enjoyment when the outdoor season returns next year.